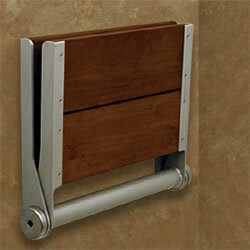 Folding wall mounted bamboo shower seat is both functional and beautiful, 18", 26", 32" widths available. Invisia spa-inspired wall-mounted SerenaSeat shower seat is designed for safety. The SerenaSeat conveniently folds against the wall, optimizing on space when it’s not in use. The moisture-resistant bamboo used for the seat provides a luxurious focal design. With two seat/back finishes and five color options for the frame, there is plenty of selection to find a SerenaSeat that suits any taste! After mounting, the back rests can easily be removed for cleaning the wall behind the seat. And unlike other shower seats, the SerenaSeat is sustainable and environmentally friendly. Please Note: SerenaSeat Shower Seat should only be installed in areas where the mounting surface is structurally sound. If you are not equipped to undertake the outlined work we recommend that you have your SerenaSeat Shower Seat installed by a qualified contractor. The SerenaSeat Shower Seat must be secured to wall with fasteners appropriate to the structural material. Fasteners must be rated for certain retention force each for maximum weight capacity. Mounting fasteners should be inspected monthly and tightened if necessary.